Heather and Anthony climb, raft, and hike, with their sweet son in tow. They are my kind of people! Don't stop doing what you love because you have kids, just alter it a little! I am so glad I met this couple. Immediately I thought to myself- we would probably hang out often if we lived in the same city. Heather and Anthony's day was full of joy and laughter. I could tell they were genuinely loving their wedding day. I found out Anthony has a secret skill of juggling pinecones. And Heather- she is tough. She lived in a tent for several months, pregnant. Yesss. And to match the beautiful day, the La Sal mountains had recently received a spring snow storm, and they were absolutely stunning! Now, over a month later- this is hardly a patch of snow left up there. Congratulations Heather and Anthony! I loved Drew and Diana's wedding day. It was windy. Not breezy, but blow-your-hair-all-over-the-place windy. Blow-flowers-off-the-bouquet windy. However, we found gorgeous locations and shelter when we needed it. And for sunset, the wind practically died. And best of all, my lav microphones still did a fantastic job picking up the vows, despite being on a cliffside with the biggest gusts of the day. Drew and Diana are both law enforcement officers. They met on the job, across the country in Florida. Looking for a change of scenery, Drew accepted a job in Moab, and Diana soon did too. Diana has a fun loving 6 year old daughter who immediately took to the red rocks and scared everyone by always getting too close to the edge. All three wrote their own vows, and they were perfect. Perhaps the highlight of the ceremony was watching Drew get on one knee as he made a vow to Diana's daughter. It was such a privilege to film this intimate ceremony. After the ceremony, we hid from the wind in a park for cake, and then went on to Fisher Towers for sunset. Fisher Towers is a stunning and majestic place. The light was fantastic, and it was a great way to end the day. Bonnie Estell, Florida photographer, was wonderful to work with. This was her first time in Moab. I LOVE being with Moab first timers. Her excitement was contagious, making for fun car time. Editing this wedding film was a complete joy and I was so excited to show it to Diana. I am obsessed with the song, the footage, Diana's beauty, the scenery, Drew's suspenders. Congratulations you two! I loved this wedding. I loved that the extended family and friends camped together before and after the wedding at the Devil's Garden campground in Arches National Park. I loved filming the children in their wedding best playing on the sandstone fins. I loved that Katy was willing and totally comfortable applying her finishing touches in the campground bathroom. And she was absolutely stunning. Seeing a wedding dress in the red rock desert will never get old to me. I loved how the setting sun illuminated the arch during the wedding. I especially loved that we had the arch completely to ourselves for the entire time. As I edited this film, I fell more and more in love with their vows. Today as I delivered their film, I told Katy today how much I loved the vows, and she responded that their vows were completely on the spot. They spoke with so much sincerity, love, and eloquence. I feel privileged that I was there to capture the vows and provide a way that they can listen and watch this incredibly intimate moment, forever. 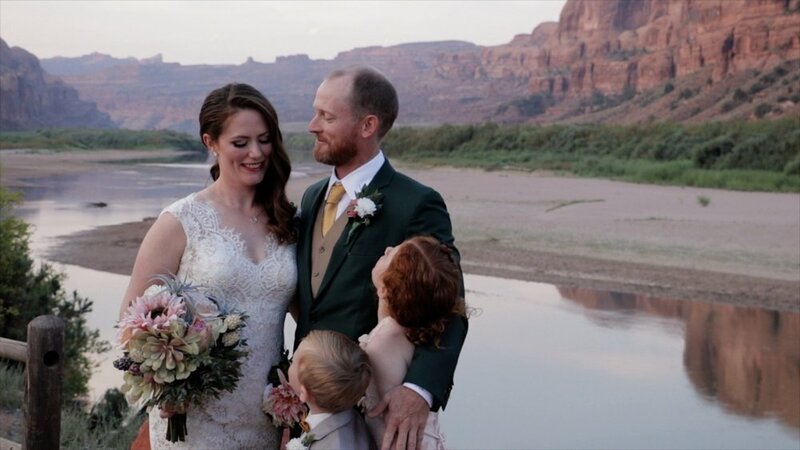 Lexi and Taylor's beautiful wedding weekend began with an intimate, romantic first look at Pack Creek Ranch. A few days later they were married in Manti, Utah. The weekend ended with a backyard sunset reception. Taylor's big grin as Lexi approached him during the first look. He was EXCITED to see her. The perfect sunset after a cloudy afternoon. Since the first look wasn't on their wedding day, Lexi and Taylor were in no hurry and very relaxed. Their romance could really shine. Driving to Manti and helping a family stranded on the side of I-70. Good thing we left with plenty of time to spare. The crowd of family and friends that traveled to Manti to support the couple. So much love. Lexi and Taylor's fun couple's session on the Manti temple grounds. That temple is stunning (finished in 1888!!) and so were the bride and groom. They were playful and in love, a winning combo. The sprinklers came on during the couple's session. Lexi kept her cool, and Taylor acted as a shield to protect Lexi. Luckily it was hot. Eating a burger, fries, and raspberry milkshake on the drive home from Manti. Filming the bride's dance with her father. I cry when I film this 100% of the time. The little boy catching the garter and his "what is this thing?" expression. The Million Dollar highway from Ouray to Silverton, CO, is one of the most incredible stretches of road in the country. Waterfalls cascade down every gully and there are too many peaks to count. Although paved, the highway has a few exhilarating/terrifying stretches where the white paint delineating the lanes practically hangs off a 500+ foot cliff. No room for guardrails. No texting and no Pokemon Go. Moab bakes in the summer so it was a welcome relief to dig my puffy jacket out of the closet and head to the San Juan Mountains. So much green! So much water! From Durango, Andrew and Amanda genuinely love these mountains. The day before their wedding they summited Engineer Peak. The wedding was held at the Eureka Lodge and the entire party stayed there for multiple nights. This secluded spot is past Silverton, CO, where the road turns to dirt and the Alpine Loop begins, basically the last ounce of civilization before steep 4x4 roads, abandoned mines, and the tree line. The Eureka Lodge is nestled in the pines at nearly 10,000 feet elevation, along the Animas river. It was built in the 1920's as a mining boarding hotel and has been wonderfully preserved. It was rustic and charming and full of history. I wanted to get myself a room and stay for a week to listen to the river and climb a few peaks. This wedding was special. Watching Andrew commit himself to Amanda and her daughter, was something I will never forget. It was such a celebration. Their vows were genuine and bursting with love. Everything turned to magic in this remarkable location. Amanda's choreographed dance with her daughter was one of the sweetest things I've ever seen, and when they pulled Andrew in at the end, I had to really hold the tears back. But truly I felt immensely privileged to witness such beautiful and meaningful moments, and I'm so glad I could capture this day for them and that they have this film to relive and remember the day. Nearby the lodge is a small campground where I happily stayed. I set up my tent by headlamp, dreamt all night that I was still filming, and then woke bright and early to hit a trail before my drive home. The trail, like all trails around there, was relentlessly steep but offered huge rewards. I ended just above tree line at a crystal clear blue lake. I then made the drive back to Moab to snuggle my children and squeeze my husband. Such a fulfilling weekend.